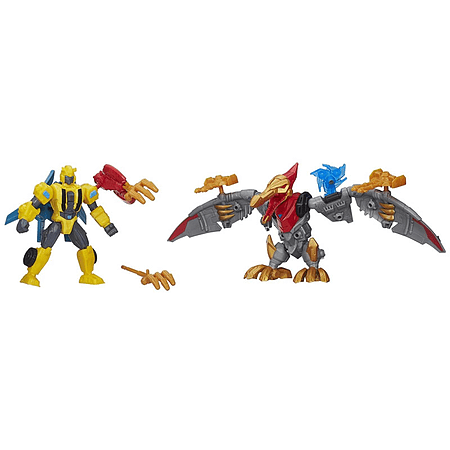 Transformers Hero Mashers Bumblebee and Strafe Team Pack. Some say Optimus Prime needed a little extra oomph during battle and Bulkhead volunteered to lend a hand ... literally. Others say that someone on Cybertron discovered some experimental Energon and started producing scrambled bots. However it started, everyone agrees only one question really matters now: are you ready to Make YOUR Mash-Up? The battle between the Autobots and Decepticons has seen many types of bots, but none of them quite like this! Make YOUR Mash-UpView larger Make YOUR Mash-Up This Bumblebee and Strafe Mash Pack features two Transformers Hero Mashers figures, each with swappable battle gear. 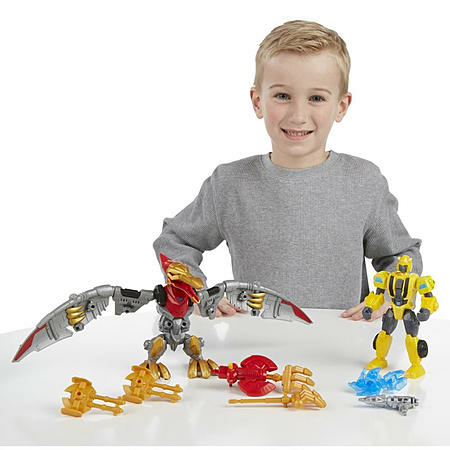 Customize your Bumblebee and Strafe figures to create the ultimate Autobot-Dinobot team up! The non-converting figures feature 7 connection points, allowing you to detach head, arms and legs, then reconnect them wherever you want! Universal connectors let you swap parts with any other Transformers Hero Mashers figure, giving you the freedom to create your own unique Transformers mash-up! Additional connection points allow you to attach battle gear from this Mash Pack to your other Transformers Hero Mashers toys, or connect their gear to your Bumblebee and Strafe figures! You decide the best way to Make YOUR Mash-Up! Create the Ultimate Autobot-Dinobot Team-Up or Make the Ultimate Autobot-Dinobot Mash-UpView larger Combine Forces With Other Bots Bumblebee is the heroic Autobot scout. Strafe is the Dinobot aerial specialist. Mash up your Bumblebee and Strafe figures together, or swap in parts from other Hero Mashers figures to create your own battle-ready bots! If Strafe needs extra firepower to battle Decepticons, he can borrow an Energon cannon from Bumblebee. If Bumblebee wants to leave the road behind, he can soar through the sky with the Pteranodon's wings.